(50 g/125 m) - (1,8 oz - Skein 136,7 yd). 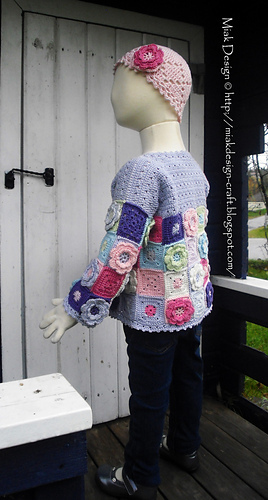 The Granny Cardigan is perfect to provide an extra layer for your little lady on breezy spring or autumn day. Perfect to put on when the sun goes down and it wil be the perfect addition to your sweet one’s wardrobe. Elegant enough for those formal occasions, yet so trendy with a pair of jeans. 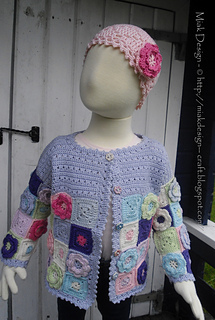 This Cardigan instruction is written for Marie’s size 4-5 years. 200 g (7,0 oz) color 1 - 100 % Egyptian cotton yarn. 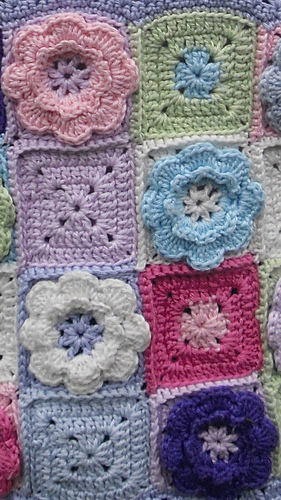 8 colors for the squares - 50 g (1,8 oz) of each color. Finished cardigan Chest: 60 cm (23 ¾ in). Finished cardigan Front Length: 48 cm (19 in). Finished cardigan Sleeve Length: 24 cm (9½ in). With (flat) 12cm (4¾ in). Square 6 x 6 cm (2 ¼ x 2 ¼ in). Pat Yoke 10 x 10 cm (4 x 4 in). 9 dc groups, 26 sc. 5 dc groups, 20 sc rows. 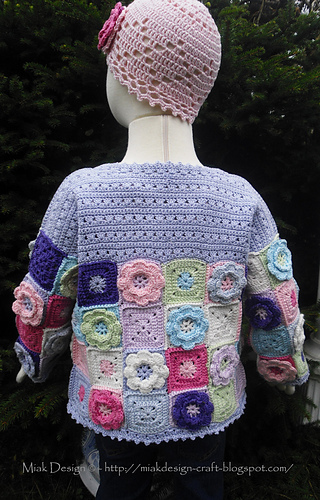 This pattern is written with American English crochet terms, conversion charts for BE crochet hooks and terms. Consisting of 14 pages with written instructions, lots of images and tutorials, pattern diagrams and charts.